In the last issue of Phlit, I discussed Panofsky’s remarks on Michelangelo and Neoplatonism, which can be found in his book Studies in Iconology: Humanistic Themes in the Art of the Renaissance. Now I’d like to briefly discuss another chapter of that book, the chapter on Piero di Cosimo — more specifically, on Piero’s paintings of primitive man. 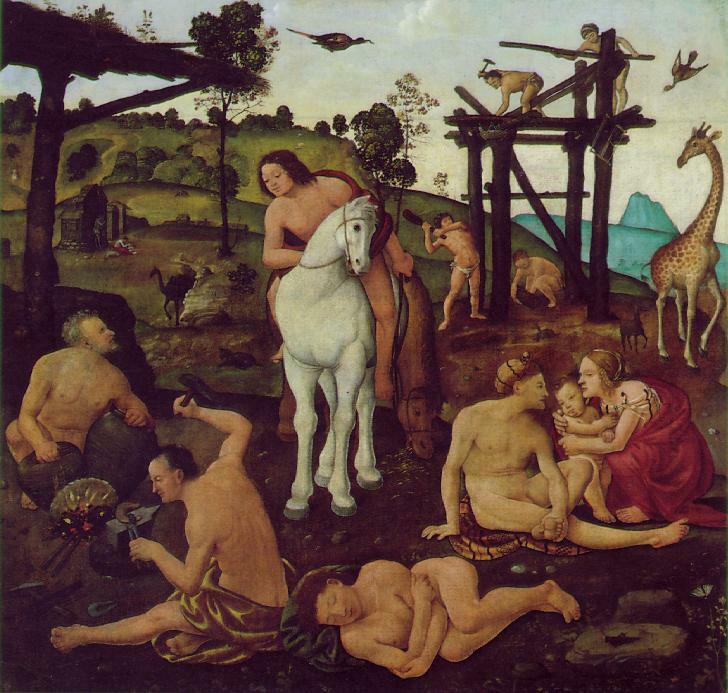 Piero di Cosimo depicted primitive life in a realistic way: “the huts of untrimmed logs, the quaintly shaped boats [are] based on archaeological research and paralleled only in scientific illustrations.”2 (Click here to see one of Piero’s primitive scenes, “Vulcan and Aeolus as Teachers of Mankind”.) Thus, Piero is closer to the hard primitivists than to the soft ones. Strange theory? Well, Piero was a strange man. His eccentricities were legendary, even in a profession where eccentricity is the rule. He loved animals, and had a corresponding dislike of his fellow man. “He would not have his workshop cleaned, nor the plants in his garden trimmed, nor even the fruit picked, because he hated to interfere with nature.”6 He lived on hard-boiled eggs, which he cooked in batches of fifty in order to conserve fuel. Only Panofsky would set forth such a bold theory, would argue that Piero had an emotional identification with primitive man; Panofsky has a flair for ideas that are bold and profound. Panofsky’s view of Piero reminds me of some of Jung’s ideas. Jung believed that each of us repeats, in his development, the development of the human race; each of us lives through, in our early life, the early history of man. Is it possible that Piero remained stuck at a primitive stage of development? Panofsky’s view of Piero also reminds me of Jung’s idea of the collective unconscious. According to this idea, the unconscious is the product of all the experiences of the human race, going back to primitive times. Perhaps Piero could identify with primitive man through the collective unconscious; Piero may have been able to access deeper layers of the unconscious than most people can. Did Jung believe that he was the reincarnation of an 18th-century man? Did he believe that all of us are reincarnations of earlier people, perhaps of our ancestors? Jung doesn’t declare himself For or Against reincarnation, but the idea interests him, and so does the related idea of karma. Jung believed that we wrestle with issues that troubled our parents and other ancestors. Jung believed, for example, that he wrestled with the problem of the dark side of God because that was a problem that his father didn’t manage to solve. Just as Jung solved problems that had defeated his father, so too he solved problems that had defeated Faust. “I consciously linked my work,” Jung said, “to what Faust had passed over: respect for the eternal rights of man, recognition of ‘the ancient,’ and the continuity of culture and intellectual history.”11 Jung built a stone tower with his own hands, and placed the following inscription over the gate: Philemonis Sacrum — Fausti Poenitentia (Shrine of Philemon — Repentance of Faust). Jung felt that his preoccupation with alchemy was another indication of his kinship with Goethe. Jung felt that Goethe’s Faust was concerned chiefly with alchemical issues; Faust himself, the legendary scholar and magician, was involved with alchemy. I recently read an excellent article in the New York Times, “Iraqi Family Ties Complicate American Efforts for Change” (9/28/03). It argues that Iraqis are so devoted to their families that they can’t conceive of “the national interest”, “the public good”, etc. This devotion to relatives will make it difficult to establish democracy in Iraq. Ed Banfield found the same devotion to relatives in a poor village of Southern Italy. In his book, The Moral Basis of a Backward Society, Banfield argued that people in the village felt no moral obligation to non-relatives; he termed this condition “amoral familism”. In my book Conversations With Great Thinkers, I argued that Christianity created a universal morality, a morality that went beyond the family. Evidently this universal morality didn’t reach every poor village in Southern Italy. It did, however, have a profound effect on Western nations, facilitating communal enterprises, both political and economic. My thoughts on this subject were influenced by Fustel de Coulanges, author of the classic, The Ancient City. This book argues that religion was once family-based, consisting of ancestor-worship. The Times article on Iraq didn’t mention the effect of Christianity on family-feeling, nor did it mention family-based religion. The article emphasized marriage customs — specifically, the custom of marrying one’s cousin. It said that “nearly half of marriages [in Iraq] are between first or second cousins.... Saddam Hussein married a first cousin who grew up in the same house as he did, and he ordered most of his children to marry their cousins.... Cousin marriage was once the norm throughout the world, but it became taboo in Europe after a long campaign by the Roman Catholic Church. Theologians like St. Augustine and St. Thomas argued that the practice promoted family loyalties at the expense of universal love and social harmony.” Cousin marriage is illegal in half the states of the U.S., but permitted elsewhere in the world. In earlier issues of Phlit, I mentioned that I work as a free-lance computer consultant, usually for small businesses in Providence, Rhode Island. I do database programming, website work, and tutoring. I call my business Database Tailoring, LLC. I’ve been doing this sort of work since 1995. The company had an arrangement with their bank, whereby the bank paid their invoices immediately, and then the company re-paid the bank over time. As an example, let’s pretend that the company sold something to IBM for $100, and sent an invoice for $100 to IBM. The bank would immediately pay the company perhaps $90. The bank would be repaid over time, using the $100 that would eventually be paid by IBM. Such an arrangement is fairly common, and is sometimes called “funding the receivables”. The embezzler created false invoices. The bank, not knowing they were false, reacted by putting money into the company’s account, just as they would for legitimate invoices. If the embezzler created a false invoice for $25,000, the bank would put perhaps $23,000 into the company’s account. Then the embezzler would withdraw that money from the account by creating checks, forging a signature on the checks, and cashing the checks. The checks were not made out to himself (that might have aroused suspicion) but rather to “Petty Cash”. His forged signature was almost indistinguishable from the real signature, perhaps because he practiced, perhaps because he used tracing paper. The embezzling continued for perhaps two years, before it was finally detected. It was detected when the bank audited the company’s books, and noticed false invoices. When the embezzler was accused of wrongdoing, he didn’t confess; rather, he said that the checks had been signed by the owner, then cashed, and the cash had been placed in the company’s coffers, like any other Petty Cash. When he was called into court, he repeated that story. Eventually, he’ll probably be prosecuted and sent to jail, but meanwhile he has ample opportunity to spend the money, or hide it, so the company may never retrieve more than a small fraction of it. It’s not uncommon for employees to steal from the companies they work for. In fact, it’s difficult to build enough jail cells to hold such people, and some prison reformers say that embezzlers and other non-violent criminals shouldn’t be imprisoned. Finally the third warehouse worker became convinced that something was amiss, and contacted the police, who staked out the building and stopped one of the thieves as he was driving away with a trunkfull of goods. One of the two thieves confessed, and testified against the other, who may end up in prison. The owner of the business may eventually recover some of his losses. My first computer customer was my father’s business, where I worked for several years before I started my own business. This company had several salesmen on the road, and each of these salesmen had a company credit card to buy gas, etc. A secretary in the company managed to obtain her own credit card, and used it to buy gas for her family, and perhaps to sell gas to her friends and neighbors. This continued for years before it was finally discovered. It was discovered by the company that issued the credit card; such companies see so many cases of fraud that they develop a nose for detecting it. After the secretary was caught, she was fired but not prosecuted.